Obituary for Mrs. Mareda L. (Holloway) Hall | Hinchliff-Pearson-West, Inc.
Mareda LaVerne Hall has been promoted to God’s heavenly army and at long last is able to hold her baby daughter. She was born January 11, 1924 in Victoria, Texas to Floyd Jefferson and Bertha Rachel McKinzie Holloway. She married George Robert Hall on July 8, 1944 in Wichita, Kansas. He preceded her in death on May 16, 2009. She graduated from high school in Goliad, Texas in 1942. 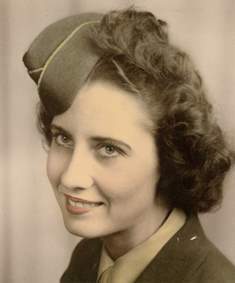 Mareda served in the 2nd Air Force division of the U.S. Women’s Army Air Corps during World War II. She was a faithful and beloved member of Road to Freedom (formerly Allen Park) Baptist Church for more than 60 years. She enjoyed baking, reading, sewing, knitting, crocheting, and spending time with family. She was employed at J. C. Penney, W. T. Grant, Carson Pirie Scott and Co., and retired from the Galesburg Mental Health Center. Surviving are one sister, Doris Maxine (Joseph) Craig of Texas; five children, Mareda R. Hopping-Davis of Morton, Illinois, Robert V. (Zoila) Hall of Rio Rancho, New Mexico, Dorothy J. Moats of Galesburg, Asa R. (Nora) Hall of Temple, Texas, and James E. (Heidi) Hall of Pleasanton, California; 11 grandchildren, 22 great-grandchildren, and six great-great grandchildren. She is also survived by many nieces and nephews whom she loved dearly. She was preceded in death by her parents; three brothers, Floyd Jefferson Holloway, Jr., Gerald E. Holloway, and Asa R. (Holloway) Brizendine; a sister, Bernice June Smith; an infant daughter, Nancy Ellen Hall; and a granddaughter, Laura Anne (Hopping) Dawson. Visitation will be 10 to 11 a.m. Monday, April 15, 2019 at Hinchliff-Pearson-West Funeral Directors and Cremation Services Galesburg Chapel. Funeral service will follow at 11 a.m. with Rev. Tom Rains officiating. Burial with military honors will be in East Linwood Cemetery. Memorial contributions may be made to the Road to Freedom Baptist Church or the Defenders of Freedom Veterans Home. Online condolences may be made at www.h-p-w.com.